Designed specifically for businesses with staff on-the-go, the TimeTrak Suite gives your Service Coordinators an easy-to-use tool to manage field staff. 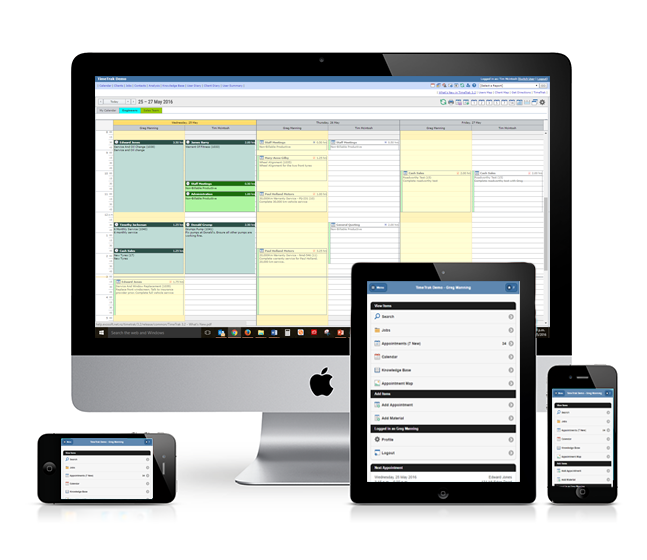 From the service coordinator direct to staff in the field, this product allows your users to keep accurate timesheets, bill time and materials used, as well as the ability to invoice the job while still on site, all from their mobile device. TimeTrak is a versatile suite of products that can be scaled to fit your business and will simplify the way you do business. Manage and oversee jobs from head office with a visual drag and drop editor. Every client and job can be different. Ensure tasks are completed with custom checklists. One source of truth for everyone. All data is accessible in real-time so there’s no re-entering or using multiple systems. Simply begin tracking your travel time and time on site with a click of a button.